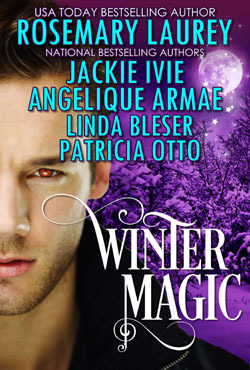 5 Tales of Paranormal Romance from USA Today and International Bestselling Authors. Enchanting stories perfect for escaping winter's cold days. Time-travel, werewolves, angels, elves and more all wrapped up in one book for those long, cold, winter nights. 1. DEAD CERTAIN by USA TODAY Bestselling Author Rosemary Laurey: Annette James only went back to Christmastown, VA. to sell her grandparents' house. She hadn't planned on Jake Warren, her big mistake from High School being in town. And she definitely had not expected her parents' ghosts to be lingering in the Sleigh Bells Inn. Certainly a holiday season of surprises. 3. CHRISTMAS WOLF by National Bestselling Author Angelique Armae: When Highland wolf-shifter Rhys MacGregor rescues a cat in the middle of a blizzard, he gets more than he bargains for including a change of fate...and heart. 4. SOUL SHARDS by Award-winning Author Linda Bleser: When you bargain with the Angel of Death, prepare to pay the price...be it a curse or a blessing. 5. A FAIREY UNUSUAL CHRISTMAS: By Eppie Nominated Author Patricia Otto: Some Christmas wishes are harder to accomplish than others. Greer made little noises, a few oohs and aahs as she searched the boxes on the lower shelves. Her enthusiasm for the task went straight to Rhys's heart. It sounded almost as if she'd never had a Christmas tree before. "I had planned on coming back early Christmas Eve to put up a small tree in the great room. But since I'm here now, would you mind helping me with that tonight?" Greer beamed. "I'd love to, though I'm not sure I'd be much good at it as Eithne doesn't put up a tree, so I've never decorated one." She shook her head, her long black hair falling over her shoulders, drawing even more attention to her too tight top. "Well, we'll fix that straight away. A beautiful lass such as yourself should not be deprived of doing up a Christmas tree." "For a wolf, you're quite sentimental." "That's the second time I've been told so today." "Really? What was the first about?" He let out a deep breath. "The Viking. But I dinna care to go into it." Greer offered a sweet smile, her green eyes bright with happiness. "I think you like Vidar, despite saying otherwise." "Bite your tongue, wumman. The man calls a kilt, a skirt. I canna be friends with such a beast." Says the wolf who was quite the beast earlier. A pink flush graced Greer's cheeks. Her cheeks grew red. "That thought was not for you to know." "I'll try to be good next time." "I don't think you're capable of being good." She turned away and focused on the boxes of tree toppers. "You, kitten, are a playful little thing." A slight giggle fell from Greer's mouth. "I think we need to concentrate on this angel you're looking for." She tilted her head. "That top box looks like it has some gold fabric in it. It could be an angel's skirt." A second later Greer's knee was on the wire shelf, her arm stretching for the container. Rhys ran over. He placed his hand on the small of her back. "Easy. I dinna need you to fall." Heat radiated against his palm, intensified his thoughts about Greer's damn top. The wumman belonged in his bed. And being this close to her was doing nothing to tame the beast inside. He wanted her more now. More than he'd ever wanted anything. Greer was going to be his tonight.